But that makes my point for this article. Grabbing ideas where you find them. 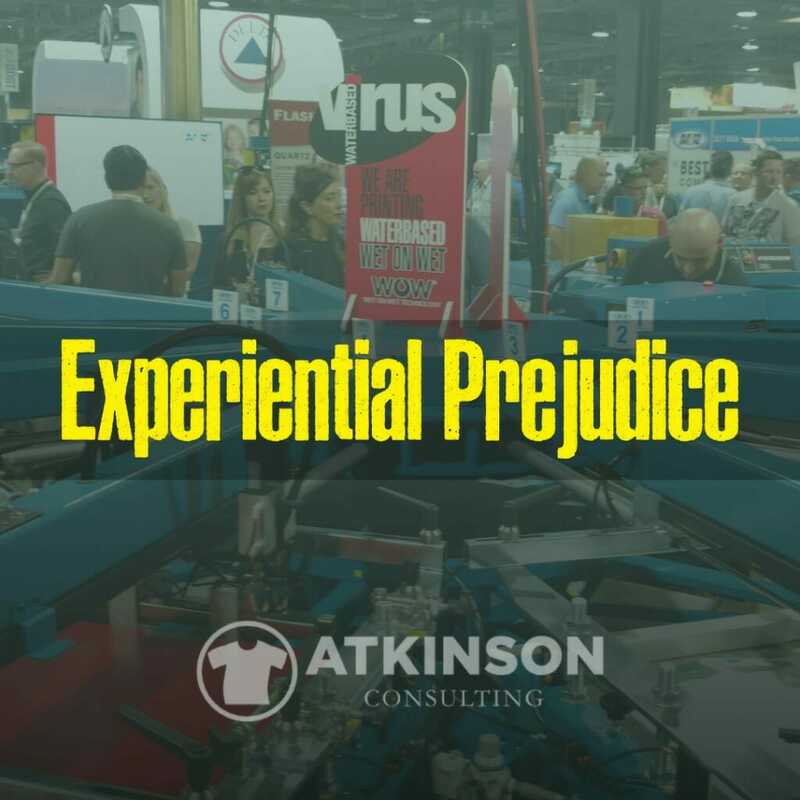 In the group post, Greg Kitson pointed out that he was speaking to Beppe Quaglia from Virus Inks about how attendees walking the floor at trade shows suffer from “Experiential Prejudice” when it comes to evaluating anything new. It was his favorite takeaway from the 2018 ISS Long Beach show. Greg was so impressed with that comment that he threw the question out to the members of the Catalyst group for discussion. His favorite takeaway wasn’t any of the new apparel offerings. It wasn’t the inks, emulsions or chemicals. Not the new software or gizmos for your shop. It wasn’t even that for the four classes Greg taught he had a record total over 500 people attending. His favorite thing from the show was someone pointing out you have an internal filter on how you evaluate new ideas. You bring your own personal baggage of experiences and observations to anything new. Your journey before predicts how you evaluate the future. 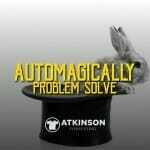 “I tried that once and it didn’t work”, can discolor your opinion on something that may be the perfect solution for you. How do you evaluate new products or new ideas? I’ll bet it is based on your own past history. Good, bad or indifferent…you slog those experiences up to the table when you are looking at something. I know I do that. Constantly. This is why you hear so often that you need to look at things with an “open mind”. A closed mind is one that operates with the Experiential Prejudices running at full tilt. Level twenty. Slammed shut and locked tight. Bam! Greg and Beppe were commenting on the waves of people that mill around trade shows and walk past something and in a split second determine that whatever they are viewing won’t work for them. They don’t even ask a single question. So when you are evaluating something is your mind open or closed? What is your process for determining the value of something as it relates to you? Are you even cognizant of this? As always, that ISS Long Beach show was fantastic. And yes, I did stop by a lot of booths and ask questions. I even took notes. Sunday morning I drove for thirty minutes to see a new type of DTG printer working in a shop away from the trade show floor. Just to see it work in action. But I also walked past a lot of booths without stopping. Guilty. Also, I absolutely loved hanging out with old industry friends, and of course, meeting new ones. There is a tremendous amount of excitement in the air for this year in the industry. Business is good for most shops. Things are looking up. But there is also an added undercurrent of anxiety about the future as well. What’s around the corner? Technology is changing. Disruption is everywhere. There were plenty of these discussions too. I even participated in a few. The one constant conversation I had nearly twenty-five times a day at the show was focused on one upcoming event in February. Every single decorated apparel industry leader that I spoke with has plans on attending this one event. Because their Experiential Prejudice filter is set to zero when it comes to finding out more about the next wave of new ideas. Having an open mind and discovering that fantastic idea or two will allow their businesses to slingshot past their competition. These folks absolutely want to be the best and are searching for ways to set their businesses apart from everyone else. The Blue Ocean strategy. 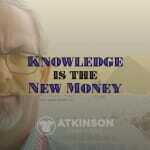 Remember, I just wrote an article about how “Knowledge is the New Money”. What you have rattling around in your skull has tremendous value if you know and understand it before the next guy even knows it exists. If you want to learn why I think ThreadX is the power event of the year, Read This. It is the real deal. I walked up to a booth at the recent ISS Long Beach show and a group of about five people was knee deep in the discussion about ThreadX. One printer was making all the arguments about why they couldn’t go to ThreadX. Time, cost, and being away from their shop were the big three. The discussion had been going on for a bit before I arrived. They brought me into it too. Hey, I had to join in…right? The challenge was that the printer was looking at ThreadX through the lens of other trade shows he has attended in the past. He has taken classes. Been to some booths. What more is there to learn? He already knew everything evidently. That all changed when another top industry expert walked up. I ambushed her and said, “Tell this guy why you are going to ThreadX”. Without hesitation, she responded with, “To learn about innovation and the future to come.” Bingo. Open mind. Experiential Prejudice at level zero. So for your business are you ready to learn what’s around the corner? Can you find what’s possible from the seemingly impossible? Or, are you going to skip the event and just keep your head buried in the sand like an ostrich? Closed mind. Experiential Prejudice at level twenty. “There is nothing good or bad but thinking makes it so.” – William Shakespeare. Want a discount to ThreadX? I have a limited number of $300 off coupon codes. Ping me and I’ll shoot you one.